very reasonable. In hindsight it was one of the least expensive places we stayed in our three week adventure and yet one of the very best in terms of the experience and the beauty. There are a lot of people in this world who would be better off to have to shovel some manure and endure some struggle. It is hard to appreciate simple pleasures and beauty if one has always had things clean and perfect and easy. That artificial perfectness tends to make people picky and not able to roll with the punches and find the happiness in any situation. Well we were about half way into our adventure when we found ourselves in Innsbruck. We enjoyed a train and cable ride up to the top of the mountains on the railway built for the Olympics in 1976. The city was lovely, and busy and bustling. It had fine shops to buy things and nice cafes serving delicious light wines with lunch sandwiches made with local sausages and fresh gelato made of the eggs and cream from local dairy farms. The gelato was rich, smooth and came in so many flavors it was difficult to choose. After lunch we were ready to trek up into the mountains to find our farm retreat for the afternoon and night. We wound around on the narrowest mountain roads we have ever driven on. We drove switch-back after switch-back following our GPS to try to find the farm. In one tiny town, made up of maybe ten houses and a small store, we stopped to regroup and make sure we were still on course. The winding around seemed to go on forever and we wanted to trust our GPS, but we were starting to loose faith. We bought a few items at the store, used the restroom and did our best to read our maps and confirm we were on course. We usually trust our technology, but we also use our common sense and try not to follow it blindly. The sites were beautiful so we decided that even if we were lost, this was one of the most scenic lost roads we had ever been on and we have had our share of being lost over the years. That sunny September day, we decided that there is no ugliness in the Alps. It was beautiful no matter where you looked. As we made our way along, we also ran into some road construction on a narrow road in one of the towns and had to back up and take another route. There are not many choices on these towns perched on the edge of the mountains but we did our best. The challenge of the hunt for it added a lot of excitement and fun. It would have been easier and taken less time to stay in the city of Innsbruck, but not nearly as exciting. As we drove up into the mountains to the farm, I was already glad we had made the decision to stay someplace “out of the box” and that was before we even set eyes on it. As we wound around the last corner and saw our farm retreat, I knew this would be an experience I would have in my fondest memories and would talk about and think about for the rest of my life. There are just some experiences you know you will always cherish. This was one of them. The farmhouse looked like a small Bavarian chalet with a wrap around porch, and with window boxes full of pink, orange and red flowers. The house with the barn underneath was carefully built into the hillside and had clearly been there for many years. This area of the Austrian Alps had very little to no flat land. There were neighbors around but not enough to call it a town; just other farm families carving out a mountain existence. We checke d-in by entering the front door of the farm house. The house had two floors. 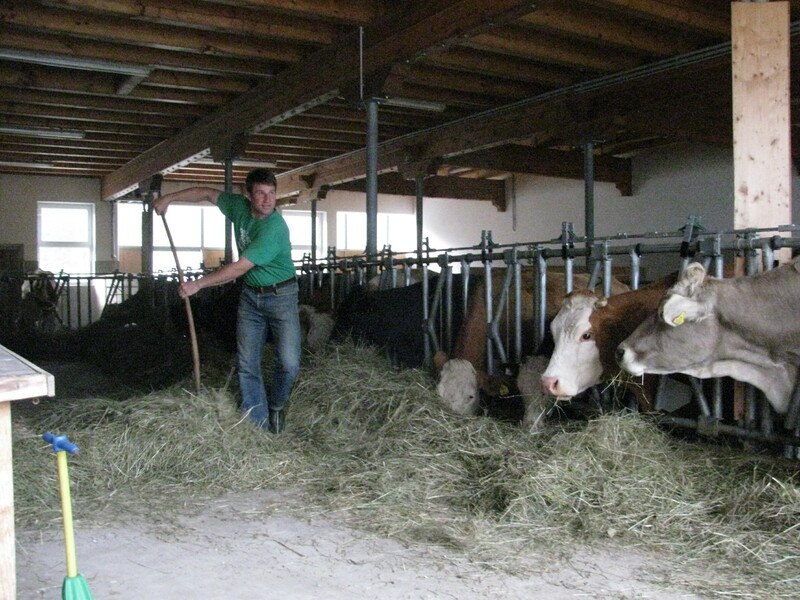 The big double doors of the barn opened on the left of the lower level and you could see the dairy cows in their pens sticking their heads out of the stations to munch on fresh aromatic green hay. They looked clean, cozy and content. The barn was impeccably clean and had friendly barn cats roaming in-between the cows. The cats came out to rub on your legs for attention and in search of a pet while you visited. The front door of the house was to the right and connected to the barn as one building. The house was two stories high with the bedroom accessed through a wide, highly polished dark wood staircase. was large and comfortable. One of softest and most luxurious beds we had stayed in while in Europe. 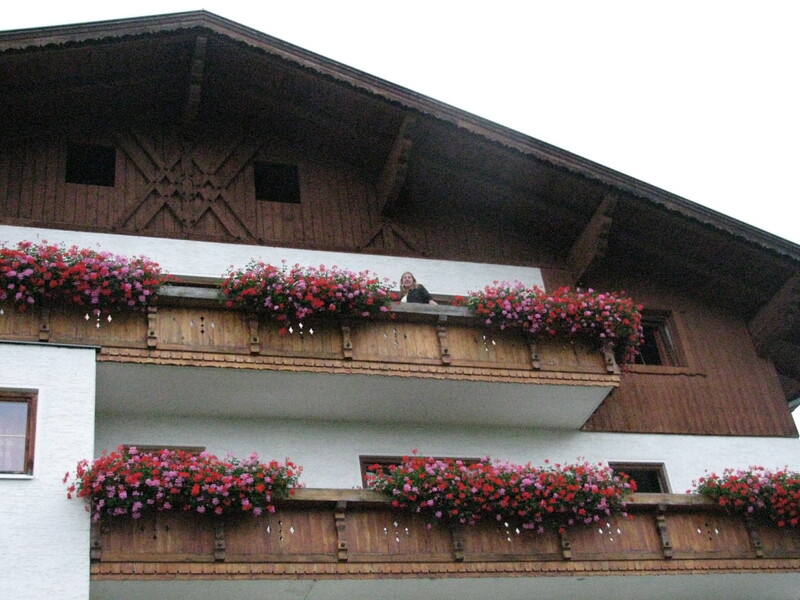 Our room had a private balcony overlooking the valleys and Innsbruck. Everything was perfectly clean and there was not even a hint of animal or farm smell. We looked around, relaxed a little, and than went exploring. It felt a little odd at first, like staying with a long lost relative you had never met, but as we looked around outside in the farm yard and went into the barn we were reassured by our welcoming hosts. He took us into the barn and we talked about his farming operation. It really is nice to have that farming connection. I had to pet the cows and hold the cats, all of which were used to having strangers looking for hometown comfort in a foreign land. 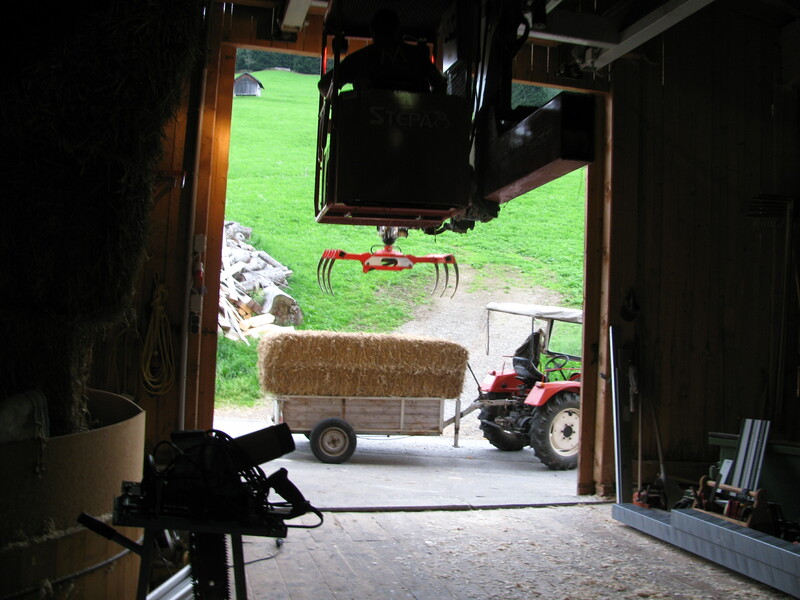 He showed us his operation, including the bulk tank to collect milk and the hay barn above, all of which were connected to the house. A neighbor stopped in to visit and he introduced us and brought out beers stored in the milk house for all of us to share. They like their beer in Austria. The bottle he gave us was way too large for one person, but when in Rome…We drank it down as he continued the tour and talk about his fields built into the mountain sides and how they operate the machinery with the steep conditions. The neighbor spoke little English, but every once in a while would add to the conversation and our host would translate. 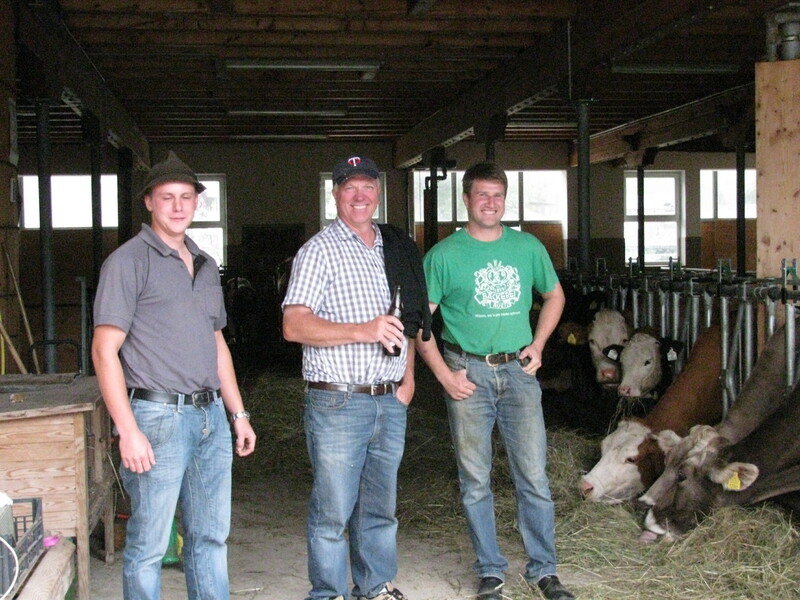 You could never find two guys as nice as these farmers. After we finished our beers we let them finish their work and went for a stroll along narrow paths among the fields and along the gravel roads connecting the homes that shared the area. As evening fell, we retreated to our room and shared some wine while the sun was setting. 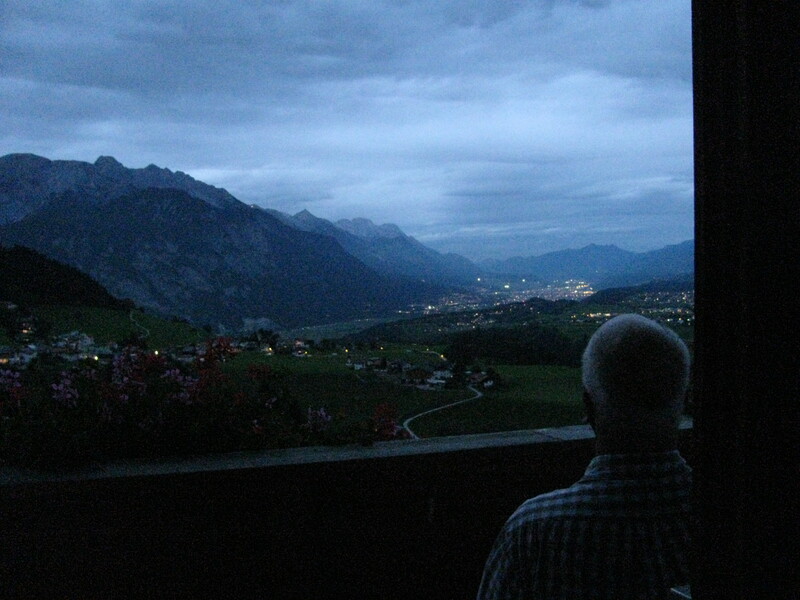 We sat on the balcony for hours watching the sun set and the lights of Innsbruck slowly appear below. The calm beauty was overwhelming.